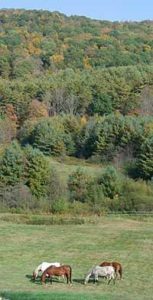 The New England Center for Horsemanship (NECH) is located in a quiet, beautiful valley in southern Vermont. The property features 17 acres of open land, brooks, a small pond, an outdoor riding arena, an obstacle “playground” and access to trails. Owners Rob and Heidi Potter have created a peaceful, safe, supportive and enjoyable environment for horse enthusiasts of all ages, levels and disciplines. The horses at NECH live outside, as nature intended, in small herds. Outside areas are equipped with shelters, plenty of room to roam and brook access. For hosting large events NECH is fortunate to have access to the Guilford Fairgrounds just down the road. This property boasts an 90′ x 160′ outdoor ring with ample parking, out buildings, and bathrooms. Heidi Potter and NECH foster safe, educational and enjoyable interactions between horses and their humans.